Garage Saurus has released upgraded H beam rods for the VR38DETT engine. The rods weigh 143.6 grams each less than the stock rods for a total weight savings of 1.89 lbs. 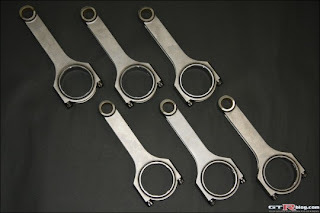 They look strangely similar to VQ35 rods. I wonder why that is?